TONI shows where information about a particular name can be found. TONI is an index, it does NOT contain the information, just tells you where to find the information. TONI contains references to the source resources. Some of these resources are reference documents held by OGS, its branches or other institution’s reference link. Some are books and similar items available to purchase from the OGS eStore or other sites. Some are small snippets of information available from the OGS as Pay per View items (PPV) and can only be ordered via the TONI system. Using TONI is free and open to all. You will incur a cost only if you want to buy something, either a PPV snippet or other items from our eStore. PPV allows you, at low cost, to view only the pertinent information about a TONI-indexed name. Some PPV items are one or more pages from a larger book, a scan of a newspaper or similar item, or the digitized transcript of a tombstone inscription. 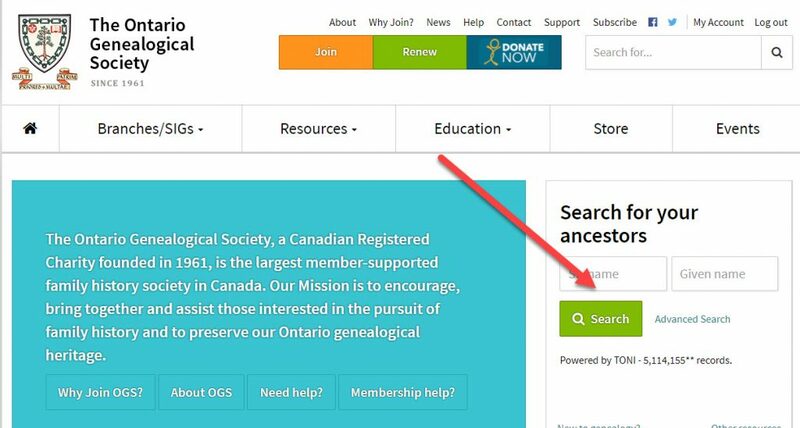 The easiest way to get started with TONI is from the OGS home page. Just fill in a name you are interested in and press search. For this example, I used the last name of Arrowsmith and the first name William Thomas. This gives a good example of all types of results. If the item is available as a PPV item, you can add it to your shopping cart with Add to Cart. If you have added items to your shopping cart, either by selecting PPV items or selecting other items from the eStore you need to complete your order to receive the items. If you have added items to your cart, the number of items and their net value will show in a box in the top right of your webpage. Click on it at anytime to review your selections and to complete your order. This is important as a single item may contain many names indexed into TONI so you should buy the item only once. The order processing system will prevent you from ordering the same item twice in the SAME order but does not warn you that you ordered the same thing in a previous order. You will also notice that there is a Help link on every item. This will bring you to this page if you need to refresh your knowledge. This help link is included in all emails. The OGS store restricts the minimum value of an order to $4.00** to allow us to cover the costs of our payment processing fees. If you have ordered only a few low-cost items, you may not have a $4.00 total. You can purchase a coupon you can use to meet the $4.00 amount. You need only to order a voucher with the amount you need to reach $4.00. This voucher is remembered by our system and will be applied to any future order for anything in our eStore. ** If a previously bought coupon reduces your order value to zero then it will be processed immediately. Once you have completed your payment system, either by providing credit card information or agreeing to send a cheque, your order will be processed. When payment has been completed you will get an e-mail confirming that your order is complete. For credit card payments this is immediate. For cheque payments the order is not complete until OGS receives your cheque. At the same time as OGS sends you this confirmation, our system will send another email with all your PPV items attached. If you ordered other items their fulfilment will be outlined in the order confirmation email. We recommend that you DO NOT include in your PPV order any items that need to be shipped, such as books and CDs. This will delay completion of your order.